Today's tweens, surrounded by computer-enhanced body images and unrelenting diet pressures, are curious about eating disorders. 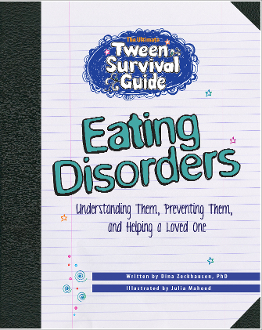 The Ultimate Tween Survival Guide to Eating Disorders is the first comprehensive guidebook written for kids from ages 8 to 13.
myths and misunderstandings and gives practical guidance for young readers. their feelings, take fun quizzes, cut out inspirational quotes for their mirror and sign the Positive Body Pledge. readers strategies which may prevent them from developing an eating disorder themselves.